The discount retail chain chain, which launched a hostile takeover bid for the Family Dollar chain this week, is close to starting construction of its first stores in Maine, including an outlet in Oakland. 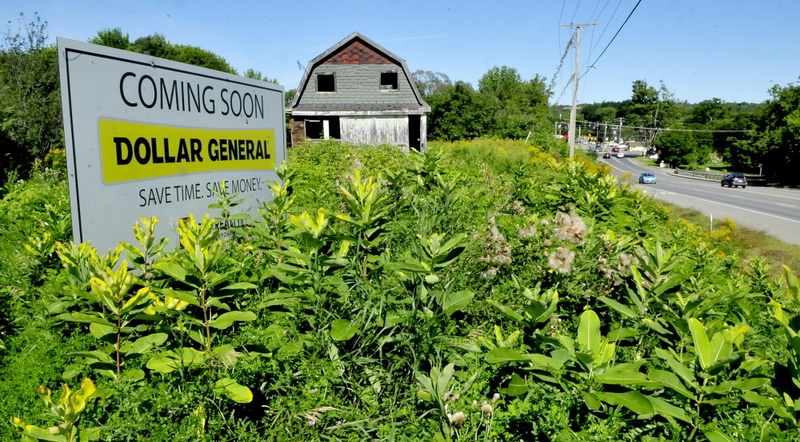 OAKLAND — Dollar General Corp., the largest player in retailing’s competitive dollar store category, is moving ahead with plans for its first stores in Maine. Dollar General, which launched a hostile takeover bid for third-ranked Dollar Tree, Inc. stores this week, is well along in the preparation for construction on a new store on Kennedy Memorial Drive in Oakland. The town’s code enforcement officer, Bob Ellis, said Tuesday that the company has been moving forward with construction preparations. “They want to get started as soon as they can,” Ellis said Tuesday morning of the construction. Dig Safe, a company that helps locate buried water, electrical, sewer or gas lines at and near project sites, has been to the location to map out potential hazards. The state Department of Environmental Protection has given its approval to the work at a site, which is near Messalonskee Stream. The construction is set to get underway in the coming days, Ellis said. A grassy, wooded area off Kennedy Memorial Drive next to Somerset Stone and Stove company will be cleared out for the new store. “The construction project will create a new side road off Kennedy Memorial Drive, called Pullen Drive, named after the town’s longtime fire chief Charles Pullen. The road will connect the new business and the existing Somerset Stone location. “Everything is pretty much in place,” Ellis said. Ellis said building plans filed with the town say the one-story building will cost about $750,000. Dollar General announced plans last spring to expand into three states in which it does not operate: Maine, Rhode Island and Oregon. The general contractor in charge of the Oakland location also is building a store in Lewiston for the company, Ellis said. Dollar General’s bid for Family Dollar, with an estimated value of $9.7 billion, came after Family Dollar had agreed to be acquired by Dollar Tree Inc. in a deal valued at $8.5 billion. While there are no Dollar General stores in Maine, both Family Dollar and Dollar Tree have significant operations in Maine, with some locations close to each other. In Waterville, for example, Family Dollar and Dollar Tree have stores in the same strip mall.